Original painting by Emma Catherine McAllister, 2017. This post was contributed by Emma Catherine McAllister, a former student in Sarah Fox's Environmental Policy and Decision-Making Course "Nuclear Narratives of the American West." McAllister is a Sophomore at University of Puget Sound, where she is double majoring in International Political Economy and Environmental Policy and Decision Making. When I first heard these words, it had been a year since Sarah Fox had introduced me to narratives of the nuclear west—one year since I had learned of the “Atmospheric Nuclear Testing and Uranium Mining” chapter in the (lengthy) tome of American environmental injustice. In this year, Professor Fox had guided my class through the systematic efforts of the federal government—specifically, through the Atomic Energy Commission (AEC)— to suppress information about the collateral damage it was inflicting in the course of its development of a nuclear arsenal. Professor Fox had opened our eyes to the horrific reality that communities living downwind of nuclear weapon test sites and communities working to extract the uranium necessary for these weapons had been deliberately kept in the dark about the devastating impact of the radiological material. She proved how these communities successfully organized to demand the release of classified data, the funding of health research, and eventually, the passage of policies dedicated to protecting health and the environment from the ravages of nuclear industries. She also made clear that there is a great deal of work left to be done. There are thousands of nuclear sites—whether unremediated uranium mines, abandoned uranium processing plants, or nuclear power plants located on multiple tectonic fault lines—that continue to pose significant dangers to the communities in which they are located. Our final project for the class was to identify a nuclear site and develop a research paper explaining its history, its role within the development of America’s nuclear hegemony, and its impact on adjacent communities. The dry, sandy soil that was poorly suited for agricultural development proved to be rich with uranium deposits. Midnite Mine, owned by Dawn Mining Corporation, capitalized on these deposits. It was located near the center of reservation land and worked on extracting uranium from 1955-1981. It necessitated the construction and use of a mill, which processed uranium ore into yellowcake (the raw material used for making nuclear rods). During its operating period, the mine and mill provided employment to the Spokane people, but also wreaked incredible destruction to tribal members’ bodies and land. The miners were not provided with any information about the dangers of uranium mining, nor any protective measures (such as face masks, laundry facilities, etc), and many developed respiratory disorders, thyroid malfunctions, and cancer. No semblance of cleanup efforts followed the mine’s 1981 closing, and it leeched radioactive waste and heavy metals into water sources on which the Spokane people depend for decades while the Spokane tribe tried to compel a cleanup effort. Eventually, they succeeded, and remediation of the mine and mill sites is now in progress, striving to employ tribal members as much as possible. The employment opportunities provided by remediation efforts guarantee some degree of financial security for the Spokane people’s foreseeable future, but do little to comfort those who have seen their loved ones taken by disease associated with the mine. Doing this research made me want to do more than be a silent observer of this tragedy of environmental injustice—I wanted to do something. I reflected on my capacities as an artist, and how those capacities could potentially be used to bring greater awareness of the ongoing reality of toxic nuclear sites. I wanted to talk to and work with the Spokane people—to whatever extent they were willing—to tell their story, as I had witnessed Professor Fox had helped tell so many stories of Downwinders and uranium-affected communities. I was ultimately unable to travel to the reservation in the course of the semester, and unable to contact community members before the deadline of the project. But in still having a pressing need to do something, I found a photograph taken by Jed Conklin for The Spokesman-Review newspaper and turned it into a black-and-white painting. a tableau of the grief and anguish of the Nuclear West. 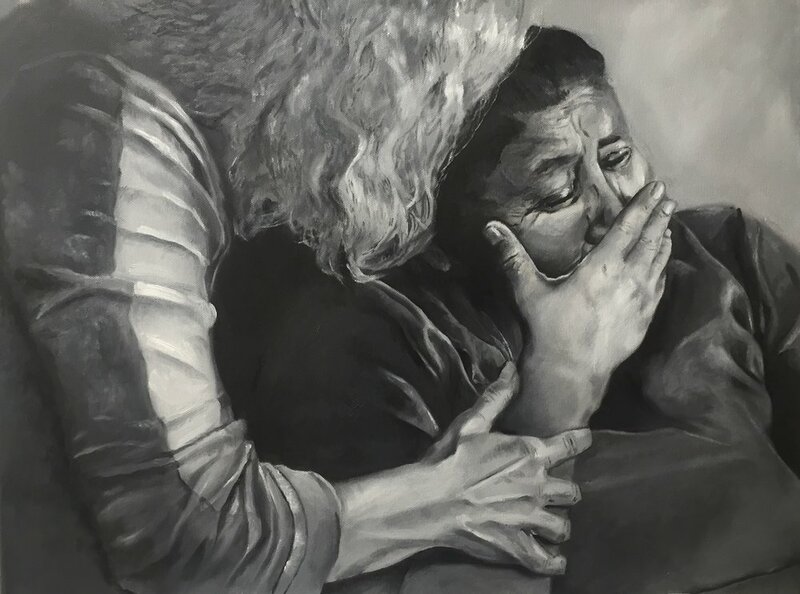 In the photograph, “Charlotte Corral [is] break[ing] down in tears while speaking about her husband, Chico, in their home on the Spokane Reservation” and “Sandra Belvail, a volunteer advocate who is helping Chico make a radiation compensation claim, offers comfort.” Originally, my idea was to render this photograph as a black-and-white painting with yellow splattering or superimposed landscape of the mine to represent the destructive contamination of uranium into the lives of those pictured--elements from Navajo artist and Downwinder Ed Singer’s painting “Łeetsoii shaa yíjooł (I Am Downwind)." However, after finishing the black-and-white transmutation of these two women onto canvas, I did not want to present such a jarring representation of the role of the toxic uranium, and left off with the painting being just a way for me to acknowledge—to bear witness—to the tragedy suffered by Charlotte and by the Spokane people. I ended up not attempting to disseminate the image at all, uncertain that those who I depicted (and the Spokane/nuclear-affected community) would support the effort, and not wanting to use Charlotte and Sandra’s likeness in a way to which they had not explicitly consented. 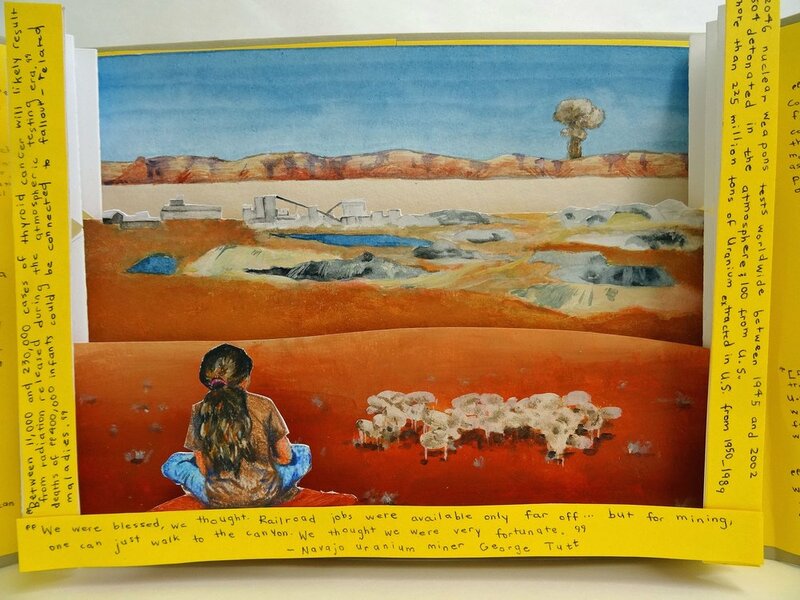 My next venture into grappling with the Nuclear West through art was in the creation of a “tunnel book,” featuring a Native American young woman in the foreground of the tableau gazing at the mushroom cloud of a nuclear test in the background. Between her and the cloud is a flock of sheep, representing the livestock herds devastated by nuclear fallout from atmospheric testing, and a uranium mine representing any of the 10,000+ that still dot the Western landscape. On the panels of the book flanking this scene, I include quotations from Professor Fox’s Downwind: A People’s History of the Nuclear West, with uranium-mining related excerpts on the left-hand panel and atmospheric-testing related excerpts on the right-hand panel. The painting now hangs in my room and the book sits on my desk, offering small reminders of the necessity of continuing to bear witness to environmental injustices, particularly those faced in particular by nuclear-affected communities. It also reminds me to stay vigilant and informed about new threats, new additions to the legacy of the Nuclear West. The current administration’s marked preference for extraction industries and profit over the wishes and best interests of the American people is epitomized in the downsizing of the Bears Ears National Monument, despite 96% of public comments to the Department of the Interior supporting the monument’s status. This downsizing of the monument seems indicative of the administration’s support for the expansion of the Daneros uranium mine at the expense of the rich cultural and historical legacies of the site, and at the potential danger of repeating our country’s history of foisting environmental injustice on marginalized communities. I affirm that I see the brutality of what Downwind and uranium-affected communities have endured. I believe them, and I believe what happened to them was profoundly unjust. I would be honored to use my opportunities as a scholar, as a person of privilege, and as an artist to help these communities heal and to tell their stories. We must work together to oppose the repetition of history—the repetition of the unacceptable devastation of the Nuclear West. If you are part of a community (or know of one) interested in collaborating with me to have its story told artistically, please email me at emma.art.mcallister@gmail.com.